After you have developed some reasonable skills in correct timing and correct spacing — two of the most fundamental skills in combat application — you can proceed to developing the skills for fast judgment, quick decision and instantaneous change. This combat sequence, White Snake Shoots Venom, is effective for developing these three skills. 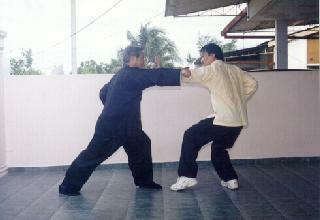 In the previous combat sequence, “Black Tiger Steals Heart”, you are used to defending against the opponent’s middle strike. Suddenly he changes his attack to a top strike. You have to judge correctly, make a quick decision and apply the appropriate defence. 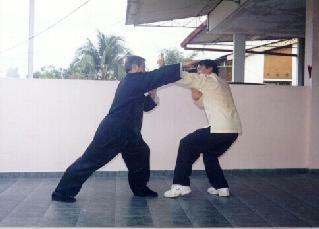 In this sequence, the attack is purposely reduced to only two choices, a middle hand strike or a top hand strike. If there are too many choices, as in free sparring, it would be difficult for the defender to judge, thus defeating the purpose of developing the skill of judgment. Before this, there is no need to make any judgment because there is only one pre-arranged mode of attack. Now only one of many controlled factors is released, marking the first step in judging and decision making — to judge whether the attack is aimed at the top or at the middle and to decide what response to make. Only very gradually, the control is released. 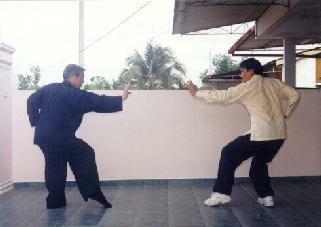 If too many controlled factors are released suddenly, the training would become brawling, not developing skills. The two skills of judging and decision are closely related. At this stage the decision is premeditated, i.e. it has already been made for you (basing on the rich experience of centuries of past Shaolin masters) so that you can focus on right judgment and right response. In other words, if you judge the attack aims at your top, you respond straightaway with “Golden Dragon”, if it aims at your middle, you respond straightaway with “Single Tiger”. Later, when you are more skilful and have a greater range of techniques, you may insert decision making before your response. For example, when you have judged that the attack is aiming at your top, you may decide which of a number of alternatives you will respond, depending on what advantages or situations you wish to create. Suppose your opponent makes a top attack but you misjudge it to be a middle attack. So you respond with “Single Tiger Emerges from Cave” instead of “Golden Dragon Plays with Water”. 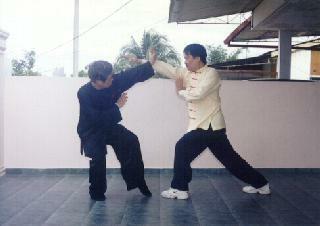 It is a mistake, and in a real fight the opponent’s attack may have pierced into your throat or eye. But, of course, in training your partner would stop a few inches before target. Untrained persons would just freeze, not knowing what to do. But you don’t. You just tilt your body slightly forward to your side, and simultaneously change your tiger-claw into a dragon-form and “thread” it upward, deflecting the attack. 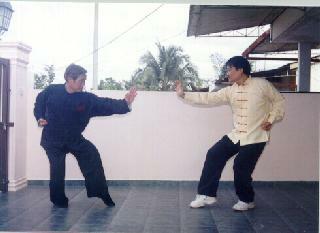 Your partner would have stopped his attack momentarily for you to implement the belated move. Initially you would be hesitant. There would be a gap of a few seconds between realizing your wrong judgment and making the appropriate changes. But gradually you would reduce the gap until eventually the change would be instantaneous. You would have developed the skill of instantaneous change. These skills are, of course, very useful in our everyday life. In the business world, for example, there is a saying that a bad decision is better than no decision. So, if your host asks whether you prefer chicken curry or beef steak, don’t say you don’t know. Make a decision. 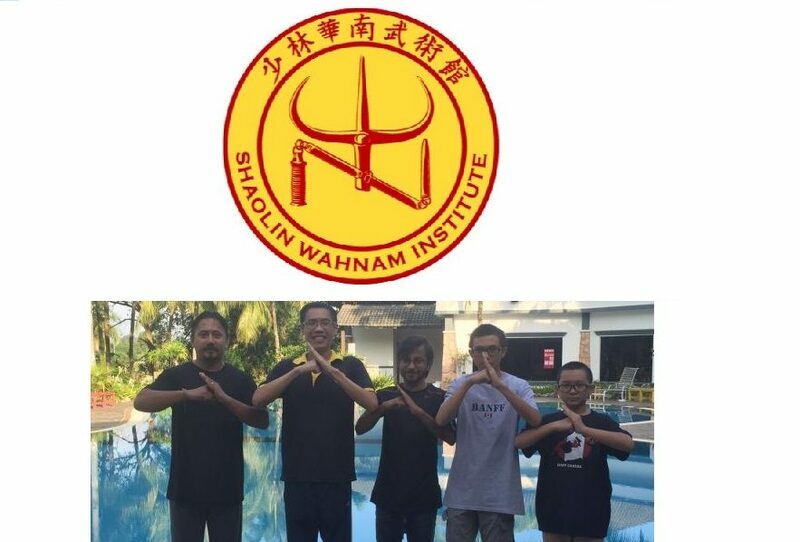 Shaolin students are trained not just to make decisions fast but also correctly. But if we make a wrong decision, we do not just remain frozen, and blame others or ourselves; we make correction immediately. Suppose a heavy object is crashing onto a person. Often, taken by surprise he remains motionless. But you would have jumped aside elegantly. What makes the difference? You have undergone systematic training but he hasn’t. This entry was posted in Combat Sequence, Grandmaster Wong Kiew Kit, Kung Fu, Shaolin, Shaolin Wahnam, white snake shoots venom and tagged combat sequences, fast judgment, Grandmaster Wong Kiew Kit, instantaneous change, Kung Fu, quick decision, right judgment, Shaolin, Shaolin Wahnam, white snake shoots venom on October 30, 2015 by Wei Joo Lee. Suppose your opponent makes a top attack but you misjudge it to be a middle attack. So you respond with “Single Tiger Steals Heart” instead of “Golden Dragon Plays with Water”. 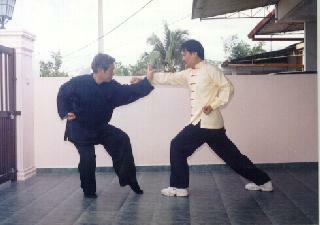 It is a mistake, and in a real fight the opponent’s attack may have pierced into your throat or eye. But, of course, in training your partner would stop a few inches before target. This entry was posted in Combat Sequence, Grandmaster Wong Kiew Kit, Kung Fu, Shaolin, Shaolin Wahnam, white snake shoots venom and tagged combat sequences, fast judgment, Grandmaster Wong Kiew Kit, instantaneous change, Kung Fu, quick decision, Shaolin, Shaolin Wahnam, white snake shoots venom on August 7, 2015 by Wei Joo Lee.